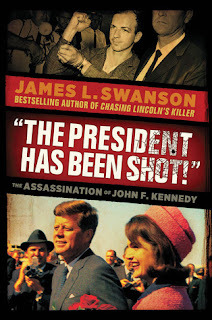 "The President Has Been Shot" by James Swanson Review ~ Love.Life.Read. Reviewed from: copy provided by publisher--Thank you Scholastic!! A breathtaking and dramatic account of the JFK assassination by the NEW YORK TIMES bestselling author of CHASING LINCOLN'S KILLER! In his new young-adult book on the Kennedy assassination, James Swanson will transport readers back to one of the most shocking, sad, and terrifying events in American history. As he did in his bestselling Scholastic YA book, CHASING LINCOLN'S KILLER, Swanson will deploy his signature "you are there" style -- a riveting, ticking-clock pace, with an unprecedented eye for dramatic details and impeccable historical accuracy -- to tell the story of the JFK assassination as it has never been told before. “There was a father with a little boy, a little girl, and a joy of each in the other. In the moment, it was no more, and so she took a ring from her finger and placed in his hands. There was a husband who asked much and gave much, and out of the giving and asking wove with a woman what could not be broken in life, and it a moment it was no more. And so she took a ring from her finger and place in his hands “ (page 180). Ask anyone who was a teenage or older about November 22, 1963, chances are they can tell you where they were when they learned President John F. Kennedy had been shot. A moment that defined a generation, it has forever changed our country. 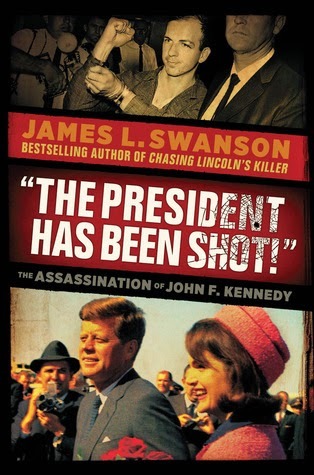 Swanson takes readers through the a brief account of JFK’s presidency, the last several days leading up to the pivotal moment, Jacqueline Kennedy’s bravery and strength as she has a nation watching her every move and learning more about Lee Harvey Oswald, including his own subsequent murder. With a subject that has been well covered by both media and conspiracy theorist alike, Swanson presents the information in an engaging tone as well as through wonderfully selected photographs that bring the information to life on the pages of this book. One of the most intriguing aspects of this book is the ending, which includes the diagrams, photos and illustrations from the assassination. Also included is Places to Visit, Source Notes and a thorough index—all adding to the usability of this title. Other Notes: Reluctant Readers might be willing to give this a go--it is a quick, engaging read. An excellent addition to already well covered topic, this book is high up on my list of best nonfiction titles of the year.